Transylvanians maintain a centuries-old culinary tradition. With so many vendors flocking from all over Romania to Bucharest's Traditional Food Market to sell their wares on a summer weekend, it's hard to stand out. On the grounds of the Academy of Agricultural and Silviculture Sciences, dozens of small plywood kiosks with gingerbread detailing display trays of what the uninitiated might dub downright odd: slices of sheep pastrami, jars of sweet green walnut jam, and portions of toba de casa(tongue, kidney, heart and other organs wrapped in a pig's stomach). Among these culinary curiosities is a foodstuff even more bizarre in its appearance: a trio of what appears to be micro-size tree trunks. Many visitors look at the woody specimens and keep walking. What they're missing is what the Romanians call branza de burduf in coaja de brad, literally "cheese in fir tree bark." In Transylvania's serrated Carpathian Mountains, shepherds still take sheep and cows to graze on the expansive slopes just as their fathers and grandfathers did. The wildflower blossoms and native grasses the cattle graze on make for milk with the ideal qualities and flavor profile to create this cheese that's found only at altitudes above 1,500 feet. No wonder this tree bark cheese is part of the slow food movement that promotes rare, endangered and traditional products. In fact, branza in coaja de brad is one of only two Romanian foods recognized by Slow Food International, a nonprofit organization that supports local products. 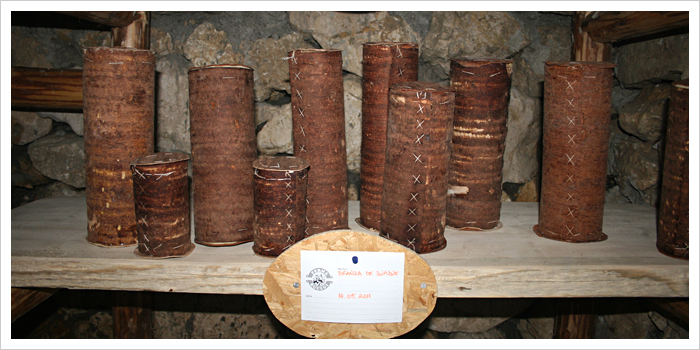 In the summer and fall, roadside stands sell the small bark cylinders of cheese along the roads coursing from Brasov to Pitesti. It's also available in eco food markets and other shops in Bran, a town more renowned for Dracula's castle than for dairy products, as well as around Sibiu, where the medieval fortifications get all the tourist attention. For a more intimate experience with fir-bark cheese, the Bucegi Farm opened Pensiunea Adriana, a cozy bed-and-breakfast in the village of Moeciu, where guests and nonguests alike can taste it or purchase small samples. Owner Marian Popoiu also allows visitors to watch the cheese-making process six miles away at the family's farm. Twenty minutes from the mountain town of Busteni, the Zamora Farm opened its doors to visitors who are interested in exploring how the tree-bark cheese is made as well as trying a traditional lunch or dinner. Many who book a special all-terrain vehicle to navigate the rough landscape also walk away with a cheese sample or two. Those who prefer to not go so far afield can overnight in the Zamora Farm bed-and-breakfast (Popasul Vanatorilor) in Busteni or buy the cheese in the restaurant. 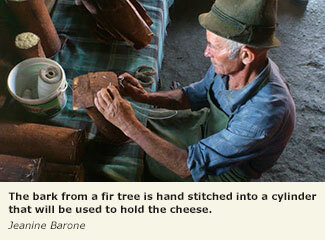 Typically, the bark used to make the cylinder that encases the cheese is derived from young, local fir trees. (Young bark is thinner and easier to work with.) The bark can be stripped from the trees only from May to July, when it's easier to peel and when the fir tree resin is abundant. When the bark is ready to be processed, it's first softened using hot whey, and then it's hand sewn into a tube. Bark is also fashioned into two disks that will be sewn as the cylinder's base and lid. The cheese making usually involves blending 70 percent cows' milk with 30 percent sheep's milk. Rennet is added to the fresh milk, allowing it to curdle. After it's pressed and the whey is drained, it's left for about three weeks. 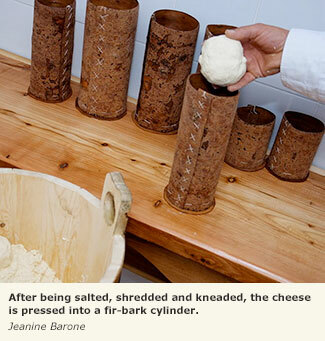 Then the fresh, white cheese is salted, shredded, kneaded and pressed into the bark cylinder, which is sealed with the top disk. From there, it is aged for some 60 days. Once the cheese is encased in the protective bark, it's good for three months if kept in a cool, dark place or, ideally, in the refrigerator. The longer the cheese is kept, the more likely it will take on a yellow hue and a more robust flavor. The nutty, salty cheese is prized for its aromatic fir resin notes. For more information on traveling in Romania, visit www.romaniatourism.com. For help planning your Romania vacation, contact your AAA Travel agent or visit AAA.com/travel. JEANINE BARONE is a New York-based travel and food writer.